It’s been more than 100 years since the hitching blocks were most likely removed from Center Street (Hill Street) in front of the homes where Maud and Bick (Betsy and Tacy) grew up. 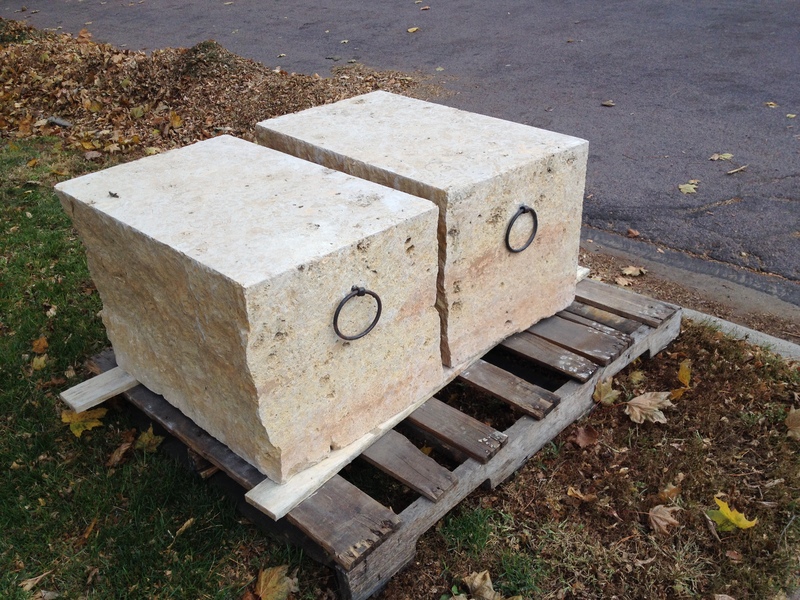 Today the reproduction hitching blocks were delivered and installed by Jason Reese from Jordan Sands. 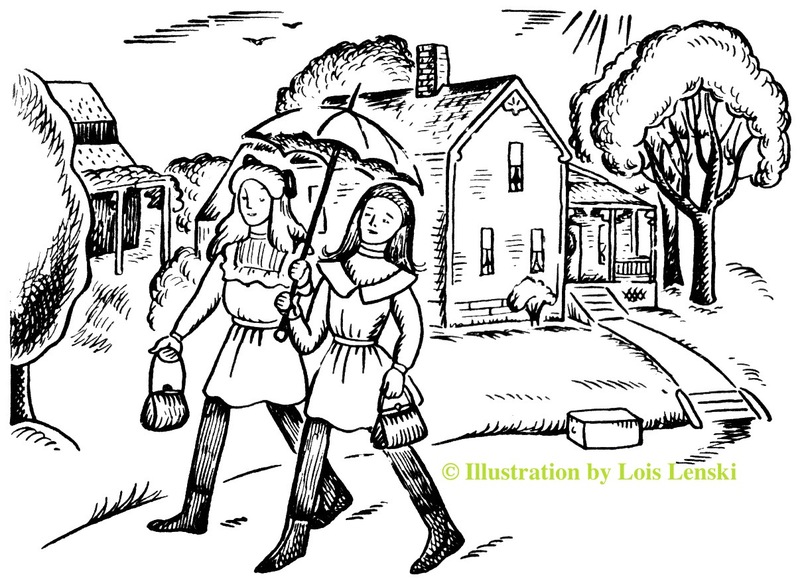 What a wonderful contribution these make to recreating the era of the Betsy and Tacy books! I was excited to be there during the installation along with my granddaughter Elsa and take photos. 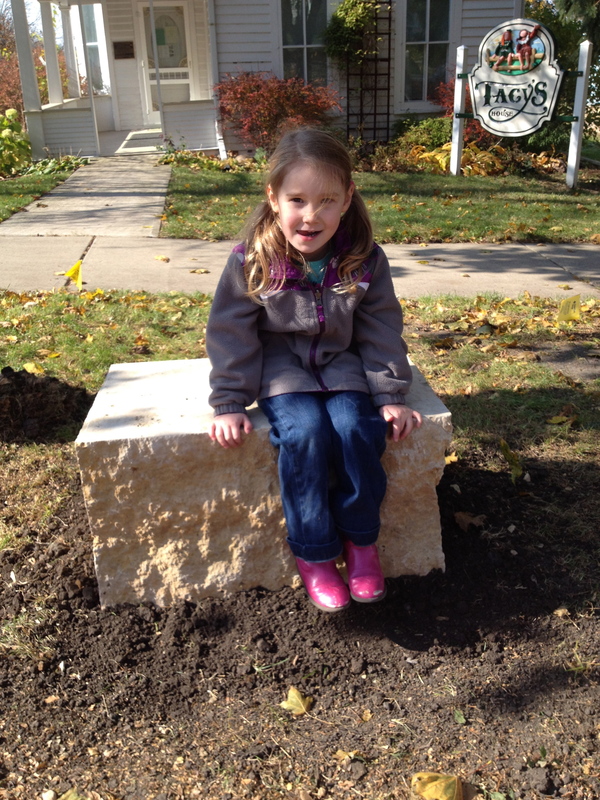 She had the special privilege of being the first little girl to have her picture taken on the new hitching blocks. Many years have passed since there has been a hitching block in front of Betsy’s and Tacy’s house on Hill Street (Center Street) in Deep Valley (Mankato, MN). 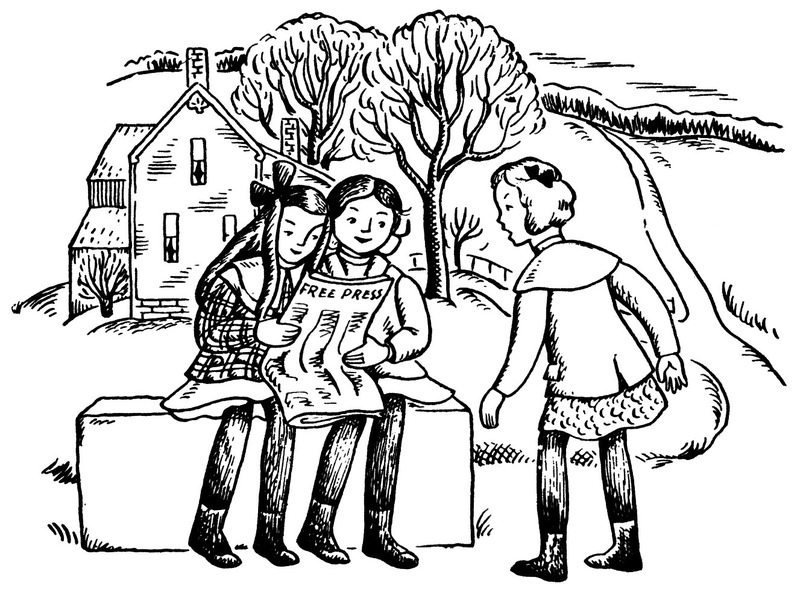 Those hitching blocks were a favorite meeting place for Betsy, Tacy and Tib. In the early 1900s, the horse and buggy was replaced by the automobile and streets were improved with boulevards, curbs, gutters, and sidewalks. No longer needed, the hitching blocks were removed. In 2014 the hitching blocks will return to these literary landmark houses! 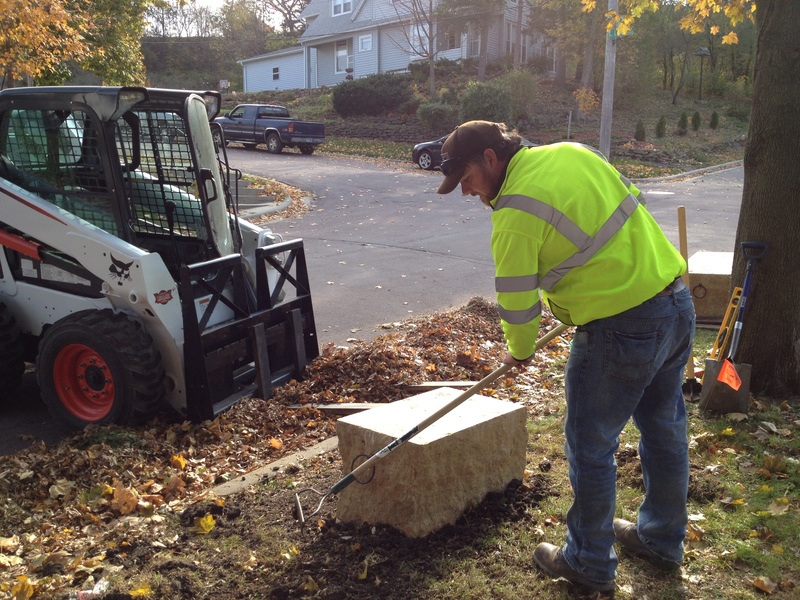 Two Kasota stone blocks have been cut and handcrafted into period-looking hitching blocks, and on Saturday, October 25th, the Betsy-Tacy Society will dedicate the installation of these blocks. 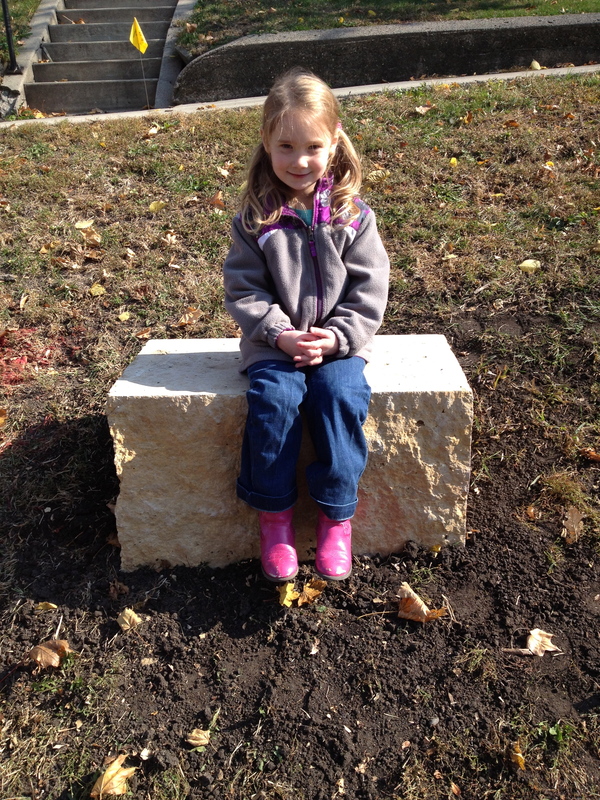 I’m so excited to have worked on this project with Maryellen Coughlan, from the Coughlan Companies, Inc., who donated the stone. Each stone block weighs nearly 900 pounds! Local historians, Tom Hagen and Ken Ziegler were advisors for the project. Tom had an original iron ring that was originally used for an old hitching block; this ring was used by a blacksmith as a pattern to handcraft four iron rings for our reproductions. Ken shared his experience with the process of attaching the iron rings to stone using lead. This week, Jason Reese from Jordan Sands (a division of Coughlan Companies, Inc.) will install the blocks at the houses. They will add one more historical feature to these literary treasures for visitors to experience. 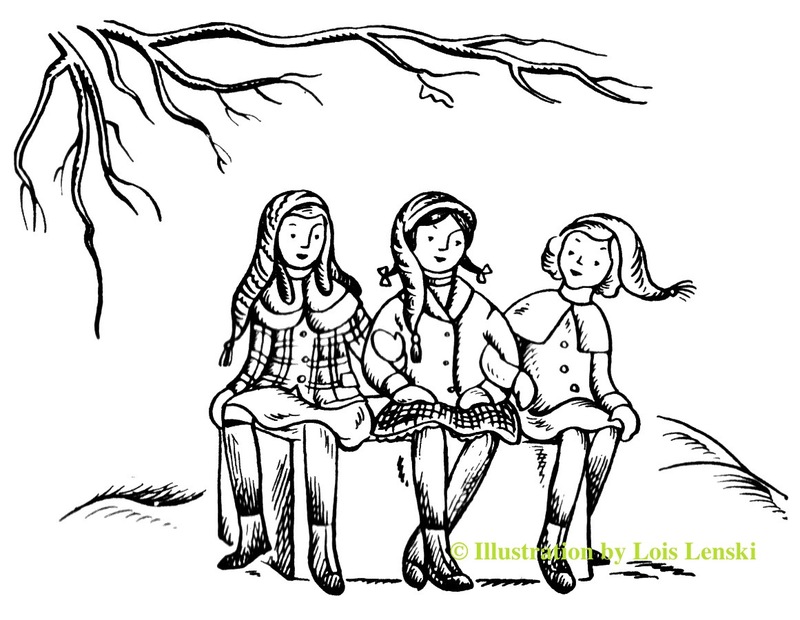 I hope you enjoy the following quotes and excerpts from the Betsy-Tacy books by Maud Hart Lovelace and the illustrations from the books by Lois Lenski.